Far Cry 4 Cover: Marketing or Exploitation? Is a cover worth a thousand words? Already experts in the open world gaming market, Ubisoft looks to open up their games in another fashion: sexuality. 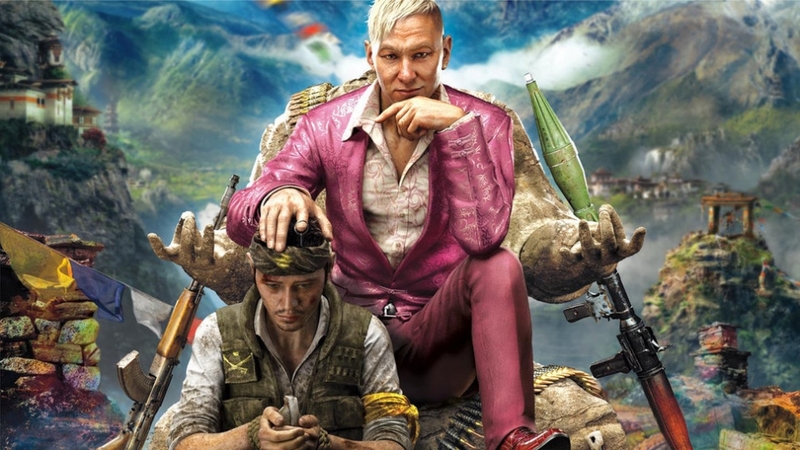 Immediately the talk of the web, the Far Cry 4 cover depicted a purple suit clad, eyebrow teased villain centered in a suggestive filled background. His companion, on his knees with a live grenade while being pet by the villain, also sparked conversation of a racial nature, but that’s quite a reach. To add a bit more to the controversy, during immense Far Cry 3 buzz one of the writers expressed concern over gay protagonists appearing in AAA gaming titles because of sales impact. I have no problem with a gay character, but the exploitation of stereotypical imagery is tasteless. Instead of relying on character development, Ubisoft instead leaned on a flashy cover. In The Last of Us, players experienced a dynamic relationship between leads Joel and Ellie as they traversed a world long removed from humanity. A slightly younger Joel experiences an incredible loss in the beginning of things and, ten years later, is rightfully a different man. Ellie peels back those years of coping based on her evolving relationship with Joel. In Left Behind, gamers experience a tale centered around Ellie that’s merely hinted at in the main title, and in the end you discover a closer relationship than initially expected. That relationship was icing on the cake, and another layer of depth to one of the best stories in gaming, ever. It established a new connection to already loved characters. What Far Cry 4 is doing with a character we’ve only just become aware of can be seen as exploitative, but was it all merely strategy? First, the snare was set right before E3, one of the largest conventions for the gaming industry in the world. All eyes are on the developers to see what’s in the works for the coming months and, with such a fuss being made over the cover, even more so for Ubisoft. Check. The imagery and ideas sparked from the box art made many wonder what exactly the team had in store for players in FC4. Then, the gameplay debut and introduction to the controversial villain, voiced by Troy Baker (The Last of Us, Bioshock Infinite), disarmed those that may have still been up in arms. I guess the cover did it’s job. Checkmate. How do you feel about this, readers? Was it brilliant marketing? Exploitation? Or are gamers up in arms for no reason? Share your thoughts in the comments.